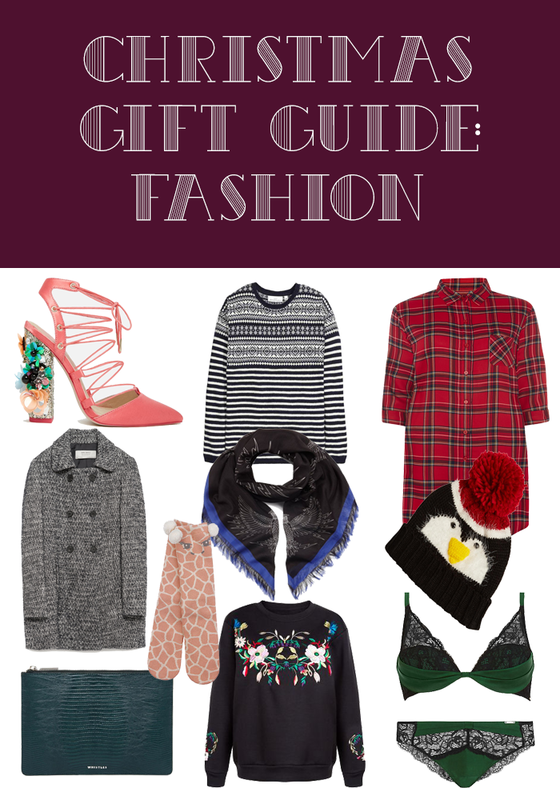 It's almost the end of our Christmas gift guides but they aren't over yet! Here are our fashion and accessory picks. We all need a cosy hat during Winter and this is the perfect choice. Not only does it have a cute penguin face on the front, £1 from each hat sale goes towards helping people facing food poverty with charities FareShare and The Trussell Trust. It's a gift that goes a long way. Lets all just take a moment to appreciate how CUTE these socks are...I mean giraffes and pom poms. I really don't think there is anyone who wouldn't love these. Also, Christmas just wouldn't be Christmas without socks! New pajamas are always a Christmas staple and something everyone will enjoy. This lovely tartan nightdress from Primark is a lovely, fashionable choice and it also comes in blue! A sweater is a wardrobe staple at this time of year and whether its for lounging or for dressing up for a cosy night out you can never have too many. The detailing and colours in this one make it look really expensive and this is the perfect example of one that could be dressed up or down. To go with the Christmas hat you need a Christmas jumper. However, I find a lot of the designs are very limited to the length of time you can actually wear them. This jumper is much more winter themed with its fair-isle design so you can wear it all throughout the winter months. Underwear is such a nice gift to receive at Christmas and this green set is so festive and expensive looking considering it's from Marks and Spencer. The Rosie for Autograph range is the perfect range to shop from when looking for lingerie gifts. During the party season, you want to leave your bag at home and opt for a stylish clutch bag. Whistles always do simple yet beautiful clutch bags with plenty of room for all of your essentials. While other colours are available, I do think the Forest Green Lizard design is my favourite. Like most girls, I LOVE receiving heels as a gift, as it's something I often can't justify spending my hard earned cash on. Now these aren't going to be for everyone so probably best not to take a gamble on these unless you know the person well, however, I think they are so fun and such a special treat to receive at Christmas! We've both been big fans of the grey coat look this year, to the point where it looks like we coordinate our outfits so a boyfriend fit grey coat definitely has our approval. The wool will keep you nice and warm yet still keep you looking stylish. When it comes to luxury accessories nothing beats Mulberry in my opinion. This beautiful cotton silk blend scarf is big and practical enough to keep you warm but also has the complete edge in the fashion stakes with the gorgeous owl print. Thank you for reading our gift guides so far! Check back tomorrow for the final guide on all things lifestyle.